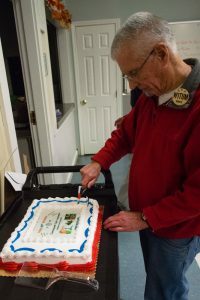 The ARRL-affiliated Quannapowitt Radio Association (QRA), a general interest ham radio club founded November 19, 1948, is still active and open to new members. The club celebrates its 70th birthday at the December 20, 2018 meeting at 7 pm. In this current day of computers and the internet, this is a truly unusual achievement. The QRA was founded by members of a World War II home front emergency communications organization known as the War Emergency Radio Service. After the end of WWII the WERS was disbanded, but the members reorganized themselves as an amateur radio club. From a core of ten members the club has waxed and waned through the years and currently has 20 actives and another 20 members at large. It continues the tradition of promoting radio technology, education about amateur radio, and being able to provide emergency communications when (fortunately rarely) needed. Members of QRA are active in all facets of ham radio operation. Imagine the difficulty of sending a radio signal to the moon, and detecting its return two and a half seconds later. Imagine the difficulty in communicating with Europe using a signal with only the power of the nightlight in your bathroom. Imagine the difficulty of making radio waves, with the speed of light and with a crest-to-crest length of your knuckle, and then using those radio waves to communicate from the top of Mount Washington to Pennsylvania. These are the challenges that motivate and involve the members of the Quannapowitt Radio Association. QRA is a general interest radio club serving the Boston and Boston-North suburb radio amateurs, computer enthusiasts and communities for seventy years. “QRA” stands for “amateurism” at its best. Membership meetings are autumn, Winter, and Spring months, third Thursday of the month, 7 PM, at the Pleasant Street Center, 49 Pleasant Street, Reading. Come on by and see what will keep us going to our club’s 100th birthday.